Everyone knows of Mount Rushmore and has seen photos of the front of the National Memorial in Keystone, South Dakota. But how many people have seen the back of it? 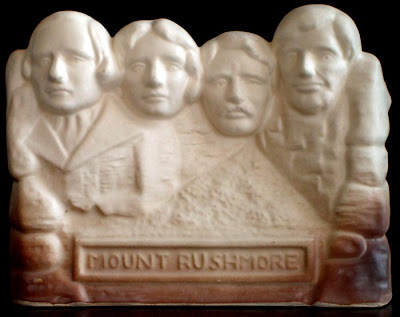 Who knew a ceramic coin bank would reveal a Mount Rushmore secret…the founding fathers were nudists. I couldn’t pass up this miniature monument due to the humor factor. From the front, it look similar to the real memorial. 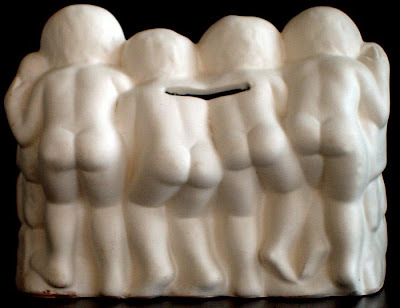 However, in the view from the back they have cherub bodies and seem to be clamoring to stay in position. Have you seen other souvenirs of the Founding Fathers getting cheeky?